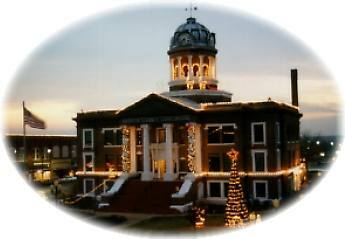 Historic Cordell, the seat of Washita County, is known for its picturesque town square and beautiful architecture. Just 15 miles south of I-40 and on Scenic Highway 152, the community is an Oklahoma Certified City and a National Trust Historic Main Street town. Following the famous Oklahoma land run of 1892 - an event that creates images of claim-jumpers and sodbusters, Cordell sprang up as a center of housing and commerce. Shortly thereafter, an unsatisfactory water supply forced the relocation of Cordell one mile to the southwest, the present location of New Cordell, now the town's legal - but seldom used - name. One of Cordell's endearing features is the imposing Washita County Courthouse, listed on the National Register of Historic Places. Designed by Solomon Andrew Layton, architect of the State Capitol, it has been called the "Grandfather of Oklahoma Courthouses." The courthouse sits in the middle of the road, leading travelers to circumvent the beautiful building in order to progress with their route. This is a beautiful approach to the city. The City of New Cordell is centered around a town square in which the Washita County Courthouse is located. The downtown business district developed around this area between 1900 and 1920. Many of these historic buildings remain and have been carefully preserved. Architect A. A. Crowell designed the 1911 Carnegie Library building, one of Cordell's National Register structures and now home to the Washita County Historical Society Museum. Crowell also designed the old First National Bank Building, constructed in 1910, another Cordell landmark now eligible for the National Register. The Cordell Chamber of Commerce hosts the third largest one-day event in the state, the annual Pumpkin Festival. For the first time in 50 years, people once again call downtown Cordell "home." With over 30 buildings painstakingly restored by the City of New Cordell and private property owners, people are saying "Turn-of-the-century Cordell hasn't looked this good since the turn of the century!" The imposing Washita County Courthouse is listed on the National Register of Historic Places. It was designed by Solomon Andrew Layton in 1910 and completed in 1911, and has been called the "Grandfather of Oklahoma's Courthouses." The grand tradition of the Washita Theater has returned to the City of New Cordell. Over 50 years has passed since the days of the Saturday matinee, the preview, and the news reel ... and now the art deco splendor of the Washita will be home to a new generation of movies and movie-goers!